Felicia Book accompanies Agent Hobbes on a collision course with the greatest evil the world has ever known. An interesting stop complicates things as the threats come ever so closer! Horror fans will truly enjoy the latest American Vampire miniseries, Lord of Nightmares, due to the terror-filled intense storyline brought to by Batman writer, Scott Snyder. 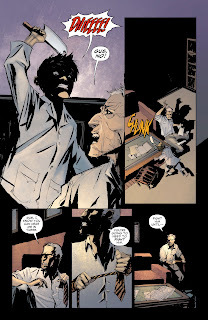 Dustin Nguyen handles the art duties and brilliantly captures the tone of the book with his dark and hazy style and color artwork by John Kalisz. As the title suggests, the focus of the miniseries is on Dracula and his resurrection that dooms humanity altogether. Snyder's style with each issue differs tremendously, as readers noticed the horror factor turned up a notch in the previous issue. 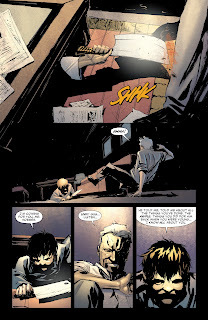 All the while slowly unveiling every facet and history of the evil, Hobbes and Book are about to encounter, Snyder continues each new issue with a different element thrown in. 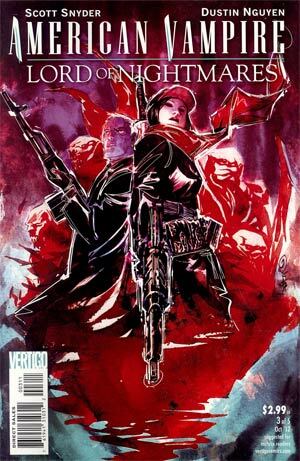 In American Vampire: Lord of Nightmares issue 3, Snyder throws in new characters that factor in the journey of Hobbes and Book and add new dimension to the storyline at hand. It's an awkward and regrettable first encounter for them and these new characters as well. It should be noted that Hobbes survives the attack from Gus, hinted at from last issue. It's only a matter of time, as the forces of evil, close in. I'm wondering what Snyder has in store for Gus, in that the young boy may have a more greater role than what we've read so far. Leave it to Snyder to dazzle readers again, if it does come about! Issue 3 is another great offering from Snyder and Nguyen, with pulse-pounding climactic ending, leaving readers hungry for more!